or the bleat of the lamb. welcome dawn with their song. what surprise among the dead! and in the shade of the silent brook. that envy tries in vain to blacken. of those I once fervently adored. since I buried them with my own hand! nor am I the same I once was. 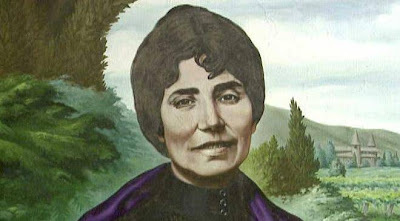 Rosalia de Castro is held by many critics to be on the level with Becquer in the poetry of nineteenth century. One of them, Azorin, considers her “ one of the most delicate, most intense , most original poets Spain has ever had”. Rosalia brought to Spanish literature the sad, mystery-permeated spirit of her native region, Galica. Rosalia de Castro was born in 1837, the illegitimate daughter of a priest and a woman from an established bourgeois family, near Santiago de Compostela in Galicia. So far as is known, her father had no contact with Rosalia after her birth. Her illegitimacy was to play a considerable role in the development of Rosalia's character. In the Spain of her time, not only was it a great disgrace to be illegitimate, but worse still was to be known as a 'sacrilegious' child, i.e. the offspring of a cleric. Her first small collection of poems, La flor (The Flower), was published in Madrid in 1857 and received a warm review from Miguel Murguia, a journalist whom she had already met in Santiago. Her relationship with Murguia resulted in their marriage in 1858. For the next few years Rosalia and her husband lived in various places, including Santiago, Madrid, Lestrove, A Coruna. The marriage produced six children, one of whom was stillborn and another died after a year. A second book in Spanish was pulished in Vigo in 1863, A mi madre (To My Mother). Rosalia's first poem in Galician was published in 1861, and in 1863, her collection Cantares gallegos (Galician Songs) appeared, representing a major contribution to the revival of Galician literature after centuries of non-existence, indeed since the Middle Ages. Cantares gallegos went into a second, expanded edition in 1872, and was followed by another Galician volume Follas novas (New Leaves) in 1880 and, finally, a last Spanish volume, En las orillas del Sar (On the Banks of the Sar) in 1884. Rosalia died in 1885, and her manuscripts were destroyed by her eldest daughter, on the author's instructions. Her work was consistently under-rated in her lifetime, at least in Castilian circles, and it is fair to say that she suffered because she was a woman poet, first and foremost, but also because she was 'provincial' and because she wrote much of her work in Galician. In the 20th century her work was reappraised, by Garcia Lorca and Cernuda, among others, and she is now recognized as a major writer in both languages. The tone of her poem in "The Bells" bear some resemblance to Emily Dickinson. One can hear the affirmation of William Carlos Williams’ “Sorrow is my own yard” in her depiction of the resilient daisy.